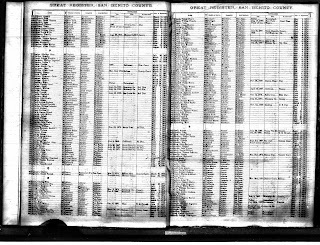 a3Genealogy: Should Genealogists Care About Voter Registers? As genealogists we have favorite records - the records we go to immediately when looking for our ancestors. For some that may be census records, for others military records. But, few researchers claim voter registers as their favorite set of records. But why not? These records can really move along your family research. Here are just a few ways I've used these records to solve mysteries. Is Your Ancestor On the Voters List? Voting rights have historically been reserved for citizens, but privileges comes with a plethora of law changes. Knowing the laws will help. For example in 1867 ex-slaves were added to the voter registrations. In 1920 women were extended the privilege to vote thanks to the ratification of the 19th Amendment. If you are researching in Europe, you will find that typically only land-owners were added to voter rolls. Another note of importance - not all registered to vote, often because they never naturalized. Many of our immigrant ancestors never became naturalized citizens, but their country-born children were eligible to vote. When researching common named ancestors, family historians can not afford to overlook voter registration records (when available). Identifying ancestors by age, nativity and occupation, I use voter registers to create a preliminary snap shot of an ancestor's residence. You must pair your ancestor's name with other distinctions: age, occupation, country of nativity (may simply state the country of Kentucky) to separate common named ancestors (especially if the name is repeated within families). Some voter registrations list physical descriptions: height, unique marks, etc. What good is a land deed, if you don't know which Moses owned it? Sometimes, the deed itself will note Sr. or Jr. or a wife's name to assist the researcher, but what if these distinctions are omitted? My Moses was born in 1804, his youngest son 1848 and a grandson, a descendant of an older son, born in 1855, was also named Moses. It did not help that generations of this family died intestate (without a will). 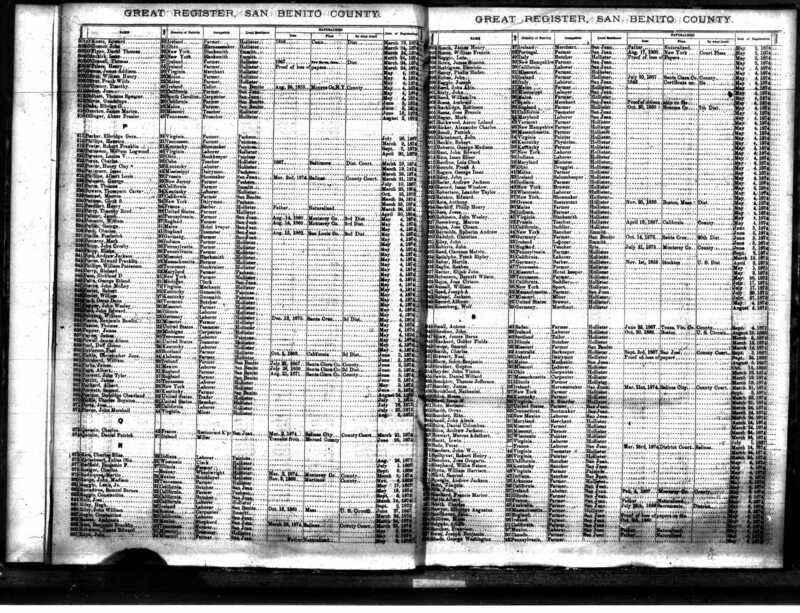 Using voter registrations coupled with the census records, tax records, deeds and probates, this active migratory family was traced making it easier to determine the owner of various land plats based on dates and county of residence. Where Was Your Ancestor Naturalized? It's not enough to know that your ancestor was naturalized. To obtain records, you may need to identify the specific court (not all were naturalized in Federal Courts even after 1906). You may find the court of naturalization listed on the voter register. After an online state and county search, turn to the State Archives or State Historical Society to retrieve any salvaged records like that at the Colorado State Archives. Of course these records may be found at a local level. Family History Library has a healthy catalog of voter registration records also. Ancestry.com offers various Chicago Voter Registrations between 1888-1892, and California Voter Registers, 1866-1898 and 1900-1968. Be sure to reference Cyndi's Lists: Voters, PollBooks, Electoral Records: Locality Specific.